The Starkey Monaural Amplifier and Headset is a convenient, all-in-one system that lets you enjoy clear, amplified conversations hands-free. 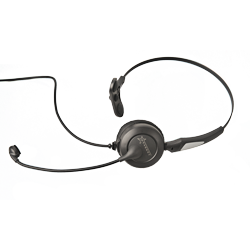 It is designed to be used in one ear and is compatible with a wide range of telephones. This unit improves the amplification of both t-switch–equipped hearing aids and cochlear implants. An adjustable volume switch lets you customize your volume level and tune out distracting background noise.